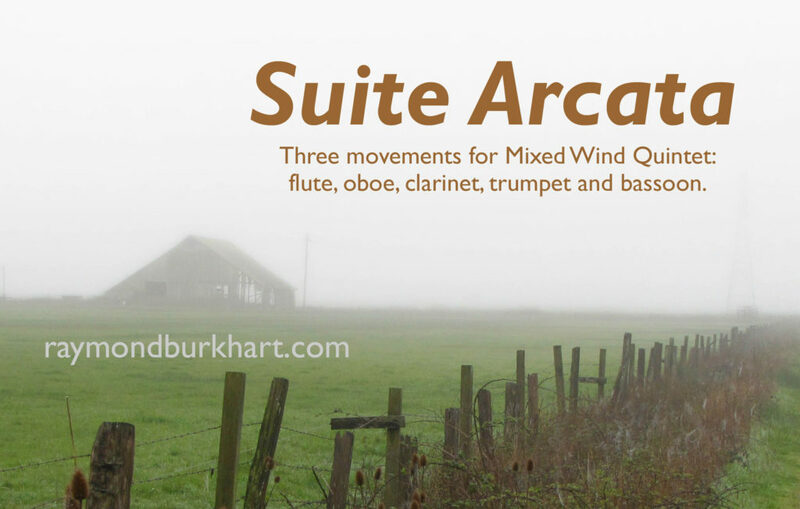 Commissioned in 2014 by the Chamber Players of the Redwoods (a chamber music society in northern California’s Humboldt County) to augment the repertoire for this unique instrumentation. I. Winter Rain is vigorous and driving, in 5/8 time. II. Coastal Fog is slow, dense, and haunting, but highly melodic. III. Summer Fun is breezy and playful, with a sunny disposition and some mixed meters. Suite Arcata is dedicated to tubist and long-time Humboldt area music educator, my friend Fred Tempas. flute, oboe, Bb clarinet, Bb trumpet (alternate part for C trumpet), and bassoon.